I've had another busy week with just a little bit of gaming time. I managed to finish up the main story in Assassin's Creed Brotherhood (awesome) and had a little bit of WoW time on the side. I'm still loving Cataclysm and the shattering of the old world. Hopefully I'll get some impressions up soon. 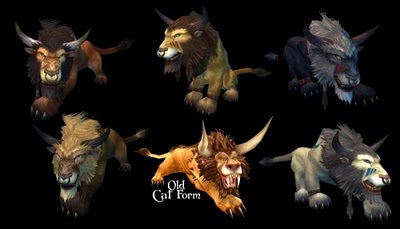 Until then I just wanted to say thanks to Blizzard for finally getting around to making new cat and bear forms for druids! Sometime between when I quit last year and started again last month they patched in the new models. It took long enough, but thank you for the change. I was tired of looking at that model and having no individual characteristics. Thanks!